What is it that gives our lives a sense of meaning? These kids from Paraguay have experienced the joy that comes from playing music. Many of them would claim that playing music is what makes their lives worthwhile. Yet the instruments they play on were made from junk someone dumped into the landfill. Can something worthwhile be made from beaten up objects that other people consider trash? Can people make something that really sounds good from stuff gleaned from the garbage can? Welcome to my page on music making and the celebration of the human spirit. Prepare to be inspired by what you see below. This is a story of innovation and creation springing from unlikely circumstances in a remote corner of the world. In fact, come with me to this slum in Paraguay, South America, right by a garbage dump, where residents make a measly living from picking through refuse and where the cost of a violin is greater than the price of a house. But this is not a story about tragedy. This is a story about triumph. "Most people realize we shouldn't throw things into the landfill carelessly. Well, we shouldn't throw away people, either." This quote from the video from Landfill Harmonic speaks to the core of the issue here. The kids playing music in this recycled orchestra are not merely fooling around with stuff from a dump; they are lifting their souls and creating art. One young girl says that without music her life is meaningless. What Have These Kids Taught Me? I’ve learned two things by watching these videos -- or at least, I’ve deepened my understanding of what I already knew. 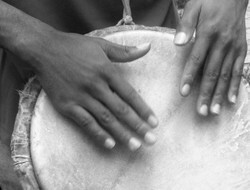 The first is that music is a language that reaches beyond culture to the very core of what it means to be human, connecting us with each other to that place where we share a basic experience of joy and expression. What gives life meaning is entering this place of connection. Innovation and Creativity The second lesson is that people can be remarkably innovative when approaching a challenge. At times we as humans can even display genius. Who would have thought that this genius would come from a slum by a garbage dump? But wonder of wonders, we retain some of that divine spark no matter where we are from or what the conditions of our lives may be. Yes, we can bemoan the fact that any child should have to practice music with a violin or flute constructed out of junk rather than purchased from a store, but to do so is missing a very important point. Those who make these recycled instruments are empowering themselves and their communities in ways more vital than most of us in more privileged circumstances ever have the opportunity to experience. Recycling and Music in the U.K. So now I’ve added another series of videos from the U.K. where professional musicians have set themselves the same challenge: how to make musical instruments from the trash heap. How Do Instruments Work? The musicians involved with this project in the U.K. see the challenge as a way to understand how sounds are created as well as a way to tackle some of the problems associated with how we deal with our waste. Their bottom line was that the instruments have to sound good when played on stage in a professional venue. As professional musicians, they felt their reputations were at stake. Making Instruments:The Challenge Continues The simple garbage picker in Paraguay who makes instruments to delight children and instil in them a love for music is working on par with these highly trained musicians, don’t you think? Have You Ever Tried to Make a Musical Instrument? What Did You Use to Build It? Did It Work? Can't Say I've Ever Tried It. These remind me of pictures I've seen about people in this country who use to make instruments out of old wash boards. The instinct to make music is very powerful. Yes! This Is What I Made . . .
We have carved native flutes before. Yes I made a flute with bamboo, a friend of mine grows it in her landscape and it needs to be cleaned out each season, we made good use of the old and dead bamboo making flutes the kids could play, they were and still are a big hit. Kids learn music best in a family setting. Try these craft projects with your kids. This article includes Landfill Harmonic but also has more videos from the Scrapheap Orchestra in the UK. The 3D printed bicycle is one of the innovations in technology using additive manufacturing technology. What Do You Think of These Musicians and Instrument Makers? I know that drums have been made out of all sorts of things for many years. This is so cool! Thanks for bringing us such an interesting article. How totally awesome! I remember hearing the quote "necessity is the mother of invention" all of my life, but I have never seen it better illustrated anywhere. Truly awesome! Yes, RubyHelenRose, I'm amazed at these talented musicians, too. Simply amazing. What a wonderful idea, who would of thought? I am glad someone did. The quality of sound is beautiful in a way quite appealing. Thanks, Brenda, for your comment. I don't think instruments will ever look the same again either. So true, Elias. They really are amazing. Sheilamarie, thank you for your wonderful post! These kids are wonderful! Amazing! Sheila, What an interesting article. I'll never look at my trash the same again.